I left my reader dangling a bit with the mention of a tasting of a wine that I had at Bourbons Brews & Bayou. Normally a follow-up article might wait a week or so, but I waited the week before I went back to try the wine again, to see if I really enjoy it, or was it just so flavorful after having a glass of Pinot Grigio, two wines that are at the opposite of each other. I have to admit that I am not a fan of Zinfandel, as I usually find it to be big, fruity and on the sweeter side for a red wine, and that is just not me. Since I grew up drinking home-made “Dago Red” it is amazing that I even really discovered wines in my youth, but I did, and I studied them with passion. I may not ever pass a sommelier exam, but I think that I have had a well rounded, albeit self taught journey in wines, with the chance to have enjoyed some great wines over the decades. After a week, I went back and since I knew that I was going to order this red wine, I wanted to have a simple burger, so as not to have anything really fight with the wine. The basic burger came with bourbon sautéed onions and Wisconsin Cheddar cheese, nothing elaborate or frou-frou. At Bourbons that also make their own barbequed potato chips, which is a nice touch, since I am not a big potato eater. It was an excellent tasting burger, while not stellar, it was far above mediocre as far as I am concerned. Now to wine that I had pondered over the week from the original tasting, as I was concerned that it may not be available, as it was not on their main menu, but I did see some signage for it on some assorted tables. 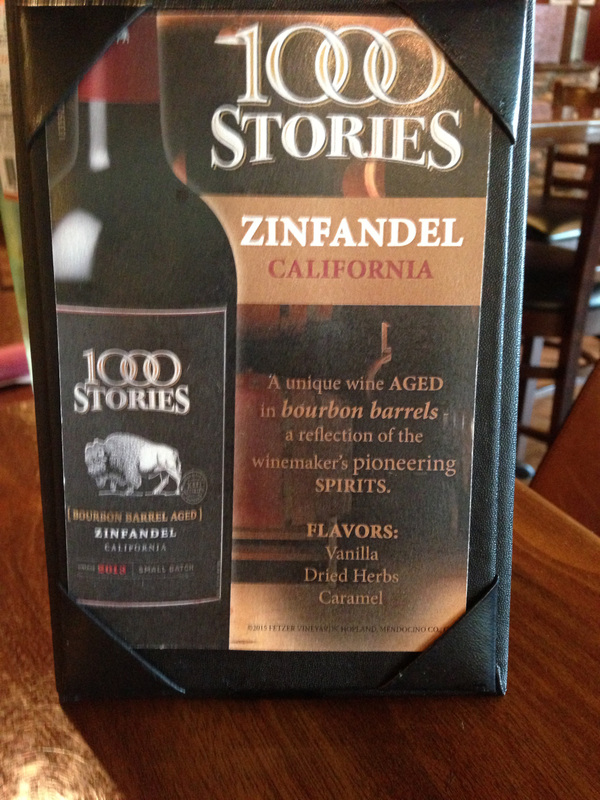 I was going to order a Zin, which is totally unlike me, and looking forward to trying it again. 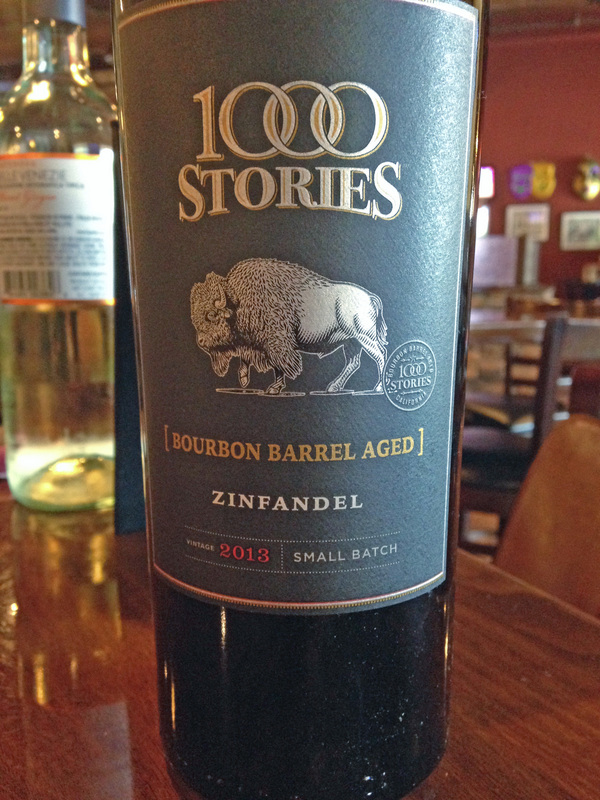 The wine was 1000 Stories Zinfandel Small Batch Mendocino County 2013. Now Mendocino County is to the far north in California and one of the larger AVAs in the state, but not as popular as other AVAs found there. Wine growing began in Mendocino County in the mid 1800s during the Gold Rush Era in California and like most areas took a major hit during the Prohibition Era and has slowly but surely started making a great comeback, as there are now eleven sub-regions for the area as well. The wine had the term “small batch” on the label, as it was playing off of the fact that the wine was aged in former Bourbon barrels, which imparted its own unique flavoring, and since “small batch” or single barrel Bourbon is one of the hot categories these days in the liquor industry. While this wine is listed as Zinfandel, there was also some Petite Sirah and Syrah blended in, which with the unique barrels used had a very harmonious and nuanced taste. The wine had that unique deep purple color of a Zin, but the nose was much more understated of a Zin, without that sweetness that I usually encounter from a Zin, which makes me pass it by, most often. The second time that I tried this wine, still confirmed that I enjoyed it, especially in a full pour and I would suggest it to anyone, even to an old curmudgeon like me that normally passes on a glass or two of Zinfandel. Even an old dog can learn some new tricks. This entry was posted in Dining, Wine and tagged 1000 Stories, California, Mendocino County, Petite Sirah, Syrah, Zinfandel. Bookmark the permalink.